Family Pets is about Thomasina, a girl living with her extended family after the death of her parents. Though she is grateful for their help, she is not happy living with her new family. Moreover, she is unsatisfied with the way her life has turned out. She thinks her life is boring and stagnant. School seems boring too. However, things changed when a stray spell changed her family into domestic pets. Thomasina must find the source of the spell and go where she never knew existed. For a girl who thinks her life is dreary, things are about to get exciting and overwhelming. For one it's funny. Abuela (Thomasina’s grandmother) is a cool character and will have you cackling over the book pages. The main character, Thomasina, seems believable and rounded. I like her a lot. The art is clean and well-defined. It shares some characteristics with Japanese manga style but still manage to retain a level of uniqueness. Family Pets sounds like the title of a NatGeo documentary. Really. And no matter how appealing a story might be, the title ought to have a bit of a pull too. The ambiguity of a title like “Family Pets” for a modern fantasy graphic novel somehow detracts a little from whatever merits the story may have. Having said that, Family Pets plots lack a bit of depth, but good character-crafting and excellent art made up for this shortcoming. I look forward to upcoming volumes. 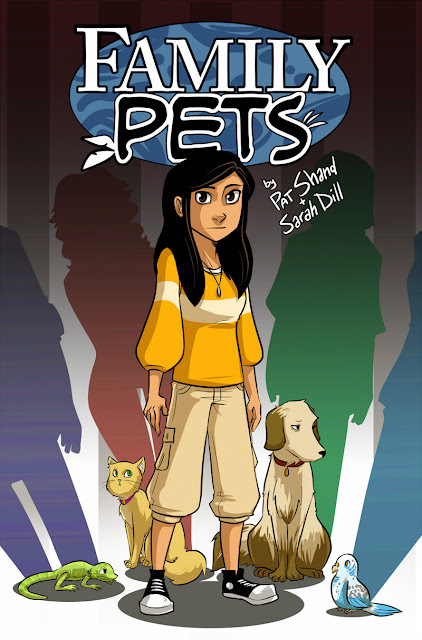 Family Pets is written by Patrick Shand and Sarah Dill. It is published by Zenescope (25 Aug. 2015). Many thanks to Zenescope for review copy. All images are © to their respective owners.